What Is A Band Pass Filter? Bottom line, a band pass filter is “an electronic circuit or device that allows signals to pass between two frequencies.” This device will be able to discriminate and separate signals of different frequencies other than those specified. Certain band pass filters will require an external source of power and it will also use other active components such as integrated circuits or transistors also known as band pass filters. There are other band pass filter types that use external sources of power and incorporate passive components that include inductors and capacitors; these are passive band pass filters. Wireless transmitters and receivers are where most band pass filters are utilized. The filter is used to limit the bandwidth of the output signal to the minimum amount needed to transmit the data. The band pass filter allows for selected frequencies to be decoded or heard and prevents the unwanted frequencies from transmitting. A bandpass filter can also maximize the signal-to-signal noise ratio of the receiver. Whether transmitting or receiving, the band pass filter, needs to have the maximum bandwidth for the speed of communication and frequency being used while minimizing the interference from the other signals. In addition to providing band pass filters, Universe Kogaku designs and manufactures Lenses, Plastic Lens Mounts and Mounting Accessories for electronics, optics, and medical applications. Universe now stocks Ultra-violet and Infra-red band pass filters for use with our UV Quartz lenses. 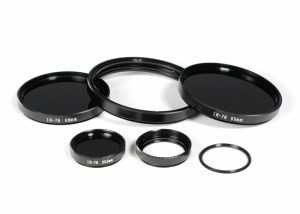 We have 25, 49, and 55mm filter thread mounts to fit our entire UV lens family.